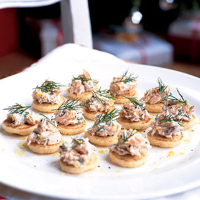 A simple but delicious warm or cold canapé, perfect with pre-dinner drinks or as a light starter. Preheat the oven to 190°C, gas mark 5. Heat the blinis according to the pack instructions. Meanwhile, flake the salmon into a bowl, mix in the crème fraîche, horseradish and chopped dill. Season to taste then chill in the fridge until ready to serve. Spoon teaspoonfuls of the mixture on to each blini, then garnish with dill, lemon zest and freshly ground black pepper.